Double the function, triple the pleasure with a combination hammock and lounge chair in one. Imagine a hammock and lounge chair combined! Oh yes, we did and came up with a design inspired by the way down-to-earth people relax. We guarantee you'll feel relaxed from the back of your neck, right down to your toe-tops. While the umbrella provides protective shading, the lounge chair responds to your slightest movement with the gentle swinging of a traditional hammock. Stand crafted of Larch hardwood which comes from managed forests and is valued for its tough, water resistant and durable qualities. Lounge frame made from powder coated metal. Redefine luxury with the Camden collection. The Camden Chaise Lounge Chair is hand-woven with light brown wicker and includes Sunbrella cushion fabric. With multiple reclining positions, relaxing in style is easy. Incorporate with other pieces from the Camden collection for a complete look. 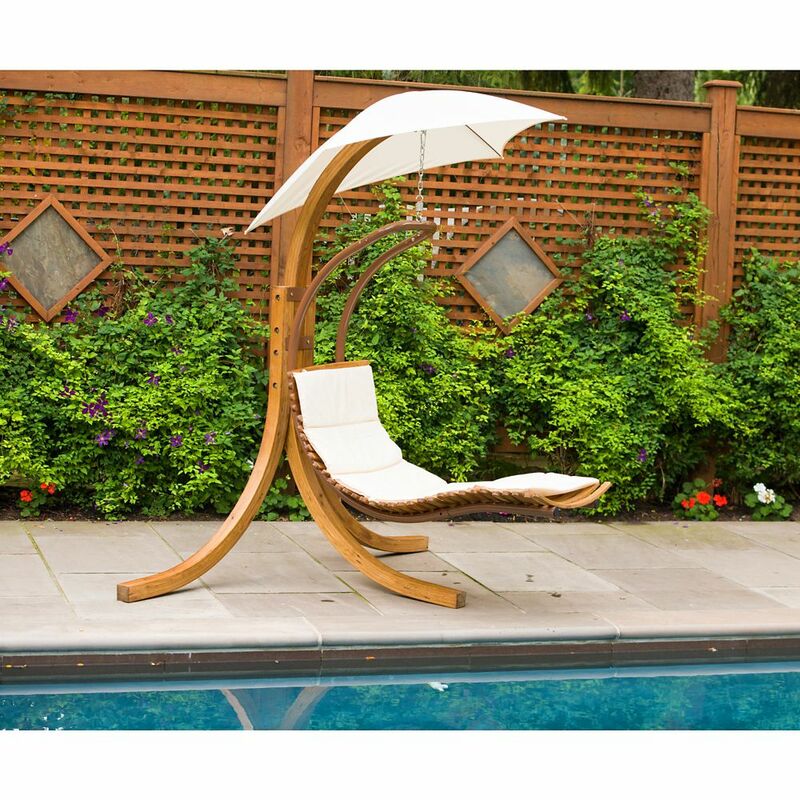 Patio Swing Lounge with Umbrella Double the function, triple the pleasure with a combination hammock and lounge chair in one. Imagine a hammock and lounge chair combined! Oh yes, we did and came up with a design inspired by the way down-to-earth people relax. We guarantee you'll feel relaxed from the back of your neck, right down to your toe-tops. While the umbrella provides protective shading, the lounge chair responds to your slightest movement with the gentle swinging of a traditional hammock. Patio Swing Lounge with Umbrella is rated 4.4 out of 5 by 5. Rated 5 out of 5 by Joyce from It took about an hour for two of us to... It took about an hour for two of us to put it together. One handyman and one senior citizen. It looks and feels very sturdy and it is very nice looking. I know my teenaged grandkids will enjoy it. Me, too. Rated 3 out of 5 by Kelly from There needs to be some way to anchor the chair besides having to take it off the stand. I have t... There needs to be some way to anchor the chair besides having to take it off the stand. I have to put some plastic chairs on each side just in case the wind comes up late afternoon or night . I didn't think to do that and the chair banged against the one leg of the stand and marred it all up. I guess I will have to use some sand paper to see if I can smooth it over . And I also was swinging sideways a little and found the stand leg lifts up slightly and moves so have to be careful . Better just to let the wind blow you a little. Wish now that I had purchased the swing chair instead.